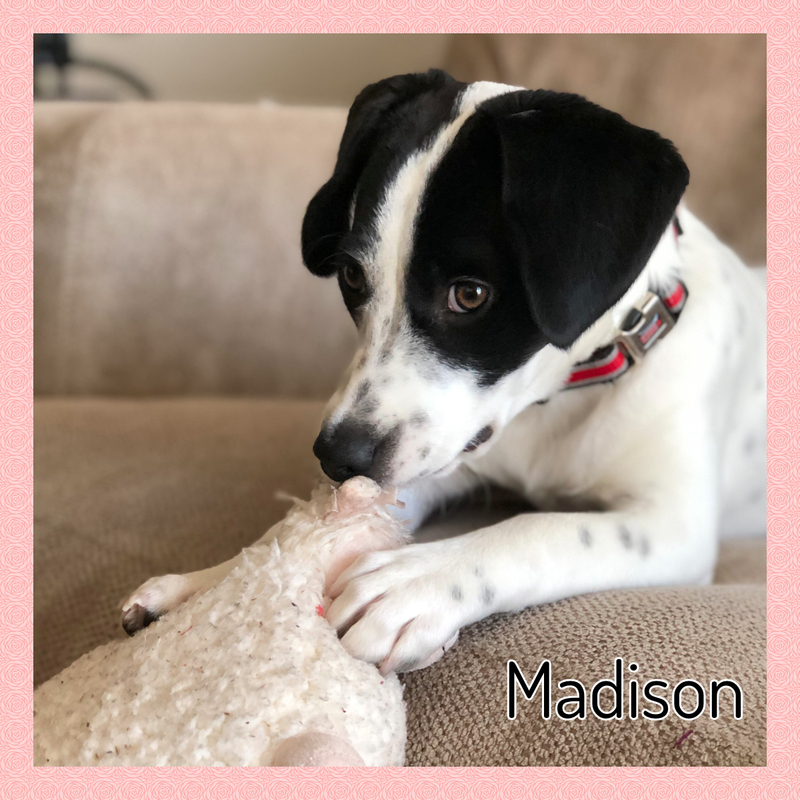 Hi, my name is Madison, but my foster family calls me Maddie! 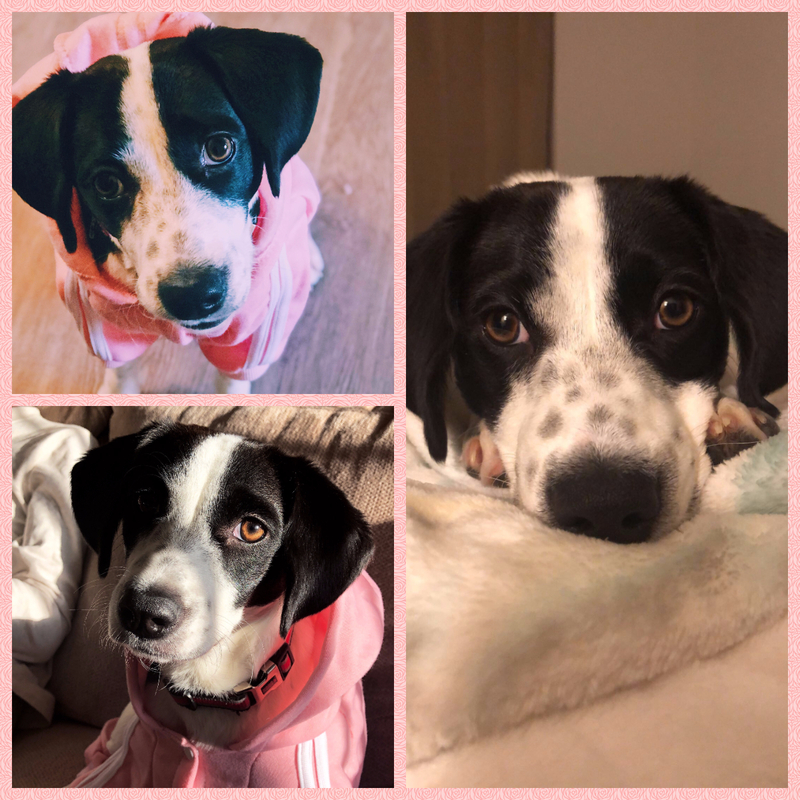 I’m a young (6-7 month old as of February) Beagle/Toy Spaniel mix. I’m the perfect size, if you ask me—small enough that I’d be comfortable living in an apartment, but not so tiny that I can’t keep up with my 60-lb. foster brother. I would love a home with a fenced-in yard, too. I am happy to spend all day snuggling on the couch, or adventuring on a walk. I love toys, too! When it comes to people, I love everyone. I’m full of wiggles and joy. Small children, teenagers, adults, strangers, I love everybody. I especially want someone who loves snuggles as much as I do. I was afraid of the cats in my foster home at first, but now I mostly ignore them. I like small dogs, though I need a slow introduction with larger dogs because I find them intimidating. I do well as long as they don’t try to bully me too much. My foster brother is a lab mix, and he and I are best buds. Mostly, I want a forever home filled with laughter, joy, cuddles, and treats. I am a good girl who’s eager to please and learns quickly, and I’d like to learn some tricks once I get settled in. I’m a fairly adaptable, low-maintenance dog, but I do want a family that isn’t gone for long stretches of time. I am house-trained, but I do have an accident sometimes when I get excited. I am comfortable to use my crate for lounging around, but I don't really like to be left alone in there for long periods of time. When I am left alone out of my crate, I chew things up because I'm nervous. I want a family who will work with me on further crate-training. Lots of people have said they’d adopt me if they could, but I haven’t found my perfect match yet. Is it you? All of our animals are in foster homes. We will schedule meet and greets after approving your adoption application to ensure our fosters are only meeting with serious applicants. Please allow 1-2 weeks for approval as AWFP is by volunteers who are full time veterinary students.